New textbooks are arriving at elementary schools in Spokane County’s largest district, launching widespread adoption of the Common Core curriculum. Common Core is a set of national standards in language arts and math education that’s been adopted by most states, including Washington and Idaho. 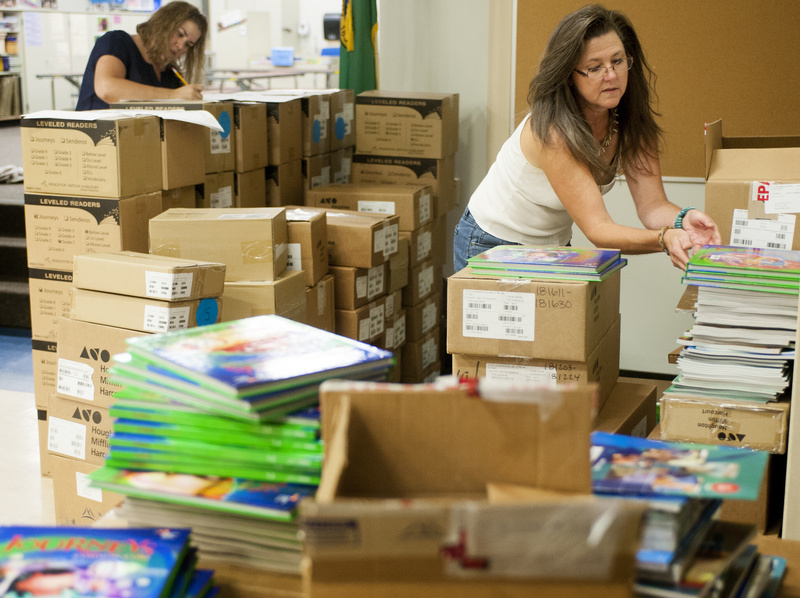 Some teachers at Roosevelt Elementary School on Spokane’s South Hill called the massive book delivery “Christmas in July.” Not only does it comply with new state standards, it’s the first time the district has had all-new teaching tools in 25 years. “They had piecemeal things before, and they had to spend a lot of time making it fit together,” said Karin Thompson, elementary curriculum coordinator. With the new materials, “now they get to focus on the art and science of teaching,” she said. Finding new materials has been a challenge since the national standards were adopted less than four years ago and many texts are still being written, Spokane Public Schools officials said. The new curriculum for language arts, called “Journeys,” cost just under $3,000 per classroom, or $1.9 million for 32 elementary schools in the district. The new language arts curriculum includes reading, writing, speaking, listening, vocabulary and grammar. Each week there’s a theme. For younger students it might be animals or behavior, and in the upper grades the themes are based on science or social studies, school officials said. Storybooks, writing lessons, vocabulary and library materials all fit with the themes to make the lessons seamless. Common Core standards accelerate grade-level expectations by about two years to better prepare students to enter college or the workforce and to compete in a global economy. Because of that, school officials expect students’ performance on state assessments to be low this spring, the first such tests after introduction of the Common Core. Spokane Public Schools Superintendent Shelley Redinger has kept on eye on other states, especially Virginia, where she was a superintendent before coming to Spokane. Several districts there have already adopted the standards and been through state testing and performed poorly, she said. In addition to “Journeys,” a new math curriculum, EngageNY, will be used in grades K-8, Thompson said. Common Core encompasses only language arts and math. No mass adoptions have been made for high school students because good textbooks aren’t available yet, said Steven Gering, chief academic officer. Grades 9-12 will use existing materials with supplements. The New York State Education Department, along with contributing East Coast educators, designed EngageNY using a federal education grant to create a K-12 math curriculum for use in school districts across the country. It teaches basic mathematical procedures, and conceptual and contextual understanding. The previous math was primarily focused on concepts. The most recent math curriculum update in Spokane Public Schools was six years ago; for some grades, it has been more than 16 years. EngageNY is free and online with the exception of printed handouts and math tools, such as dice, measuring tapes and protractors, Thompson said. The total cost is about $555,000. Teachers were given the option of teaching just one curriculum – language arts or math – but about 95 percent chose to do both, she said. Educators could have opted to start teaching language arts this year and math in 2015-16.